Happy Friday everyone! If you're an employee of the state of GA, happy furlough! I hope, if this recession has forced you to take time of with out pay that you are sleeping in (I just woke up) and that you are having either the laziest day of your life, or the most productive. I haven't decided which I'll have yet. This post was the first item on the "to do" list. Here to help celebrate the weekend, we have anirtak offering a pretty sweet giveaway. Anirtak is run by Katrina, and I have to say that after she contacted me about a possible giveaway, I could not stop visiting her etsy shop and daydreaming about all of her lovely little pieces. Courtesy of Katrina, I now own the piece that stole my heart, and made me think of my first pet. I wear this piece constantly! 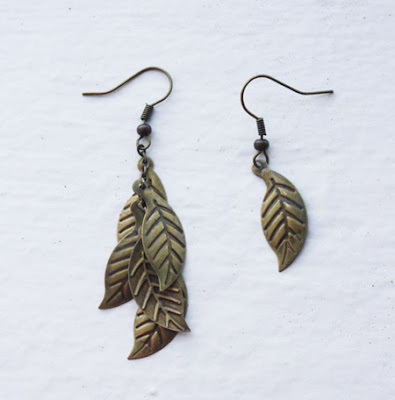 These whimsical, asymmetrical, perfect for autumn matching leaf earrings. Now, if you're afraid you won't win, but must have a piece of this well made, gorgeous jewelry, Katrina is offering 10% off to ANY D&OC reader for the duration of the giveaway! Simply enter "Downandout10" in the message to sellers, and she'll reimburse you via Paypal! These pieces make perfect gifts, so DO take advantage of the discount! Good luck to you and Happy Halloween (I stink and don't have a costume yet, bleh)! I really like the baby lone hopper necklace! You have the loveliest giveaway Christina... So I heard I won the last one...will check the post, sorry for the late reply~ buzzzy bee that I am at he moment. Thank you so much!! The fallen leaves are definitely my favorite. The anchor and rope is fun, though. I would have to go with the scissors or the baby lone hopper. So cute! Great giveaway! I like the hidden secrets locket necklace and the rain blue droplet earrings (I think that's the name!). You always shout out about such lovely shops! and this one is no exception! i love the Jade garden necklace and the Cops and Robbers Lariat one! You always find the loveliest items! I like the Jade Garden Necklace-very,very pretty! I love the anchored to nautical adventures necklace!! i love the raining blue droplet earrings. My favorite item from her shop has to be the sterling silver padlock heart necklace. LOVE IT. My favorite is the love letter necklace. So dainty and cute! I absolutely adore the lonely hopper necklace. It's so simple and sweet. That bunny necklace is SO adorable. Thanks for a fun giveaway, hope you have a great Halloween! Good morning Christina. I realize I appear like a fare-weather reader because of my commenting only on give aways, but wanted you to know that I read you daily! So yeah, the bunny one kills me. I also love the anchor one!!! I love the free as a bird necklace! these are so cute...I love the anchor! I love love love the leaves! I'm a reader, and I have the perfect shirt to go with it! My absolute favorite is the free as a bird necklace, but I love the scissors and your bunny necklace! The autumn leaves lariat and earrings are just lovely! I like the Raining Blue Droplet earrings. Such pretty jewelry! 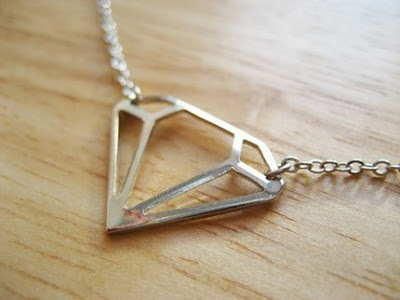 My favorite piece is the Diamonds are a Girl's Best Friend necklace. There's so many lovely pieces. Bookmarked it. My favourite is the anchored to nautical adventures necklace! I love the Jade Garden Necklace and the Raining Blue Droplet Earrings! So cute! 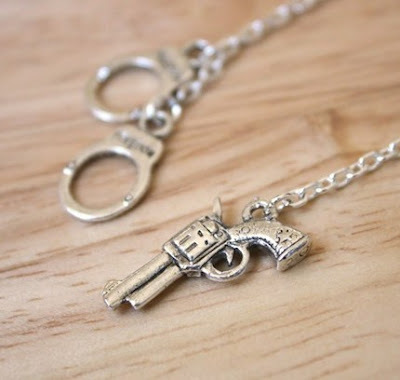 I love love the Baby Lone Hopper Necklace! Cute. 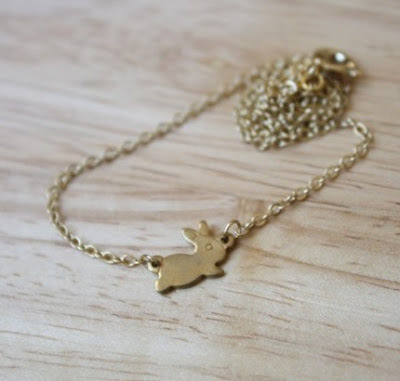 The baby lone hopper necklace - soooo sweet!! What charming jewellery!! I love the Jade garden necklace. I'm a green freak! I'm an old follower and reader. I adore the The Baby Lone Hopper Necklace - Silver! these are so cool! 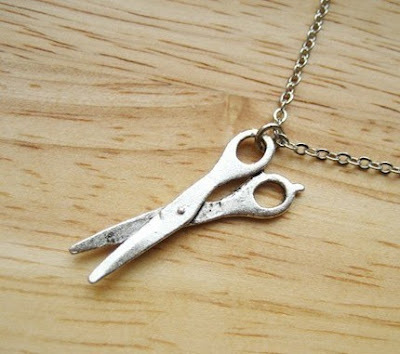 Love the scissors necklace! Such adorable jewelry! The Anchor and Rope Necklace is my fave! The hopper? MELTS MY HEART. Oh I love alot of them...I like the bird cage, the cops and robbers, the scissors the anchor and the secret love letter one. Am thinking I might buy them as chrissie presents! And my favorite... ? I can't decide between the Anchor necklace and the Wishbone necklace... both so fabulous! The Free as a Bird necklace is definitly the most awesome. I love it! hands down, my favorite is the secrete love letter. it's too cute and perfect for me! i'm a follower who also LOVES your blog! queen of heart is ultra sweet and that lone bunny hopper is too cute. I like the Free as a Bird Necklace. Just stumbled upon your blog a few weeks ago, and I love it! It gives me a pick-me-up whenever its needed. The lone hopper necklace is precious. My favorite pet was an adorable, tiny bunny rabbit. I enjoy following your blog as well! cops and robbers all the way! I love the leaves necklace and earrings... everything is beautiful!! I'm also a reader.. love the creativity found here. 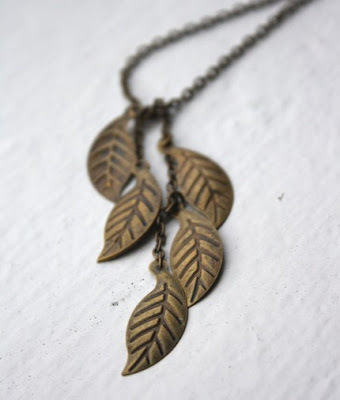 I just googled leaves jewelry earlier today... and these are gorgeous examples of it... probably my favorite of her pieces! ohlala! P.S. fingers crossed I win!! so here is my favorite item from anirtak (love this gorgeous jewelry shop now that I've found it:), The baby Lone Hopper Necklace is my fave. I'm a total sucker for bunnies!!!! I love the "free as a bird" necklace! Too cute!